Two big factors threaten to throw a wrench into NIO's expansion plans -- and Tesla is one. Shares of Chinese electric-vehicle maker NIO (NYSE:NIO) had a rough ride last month. 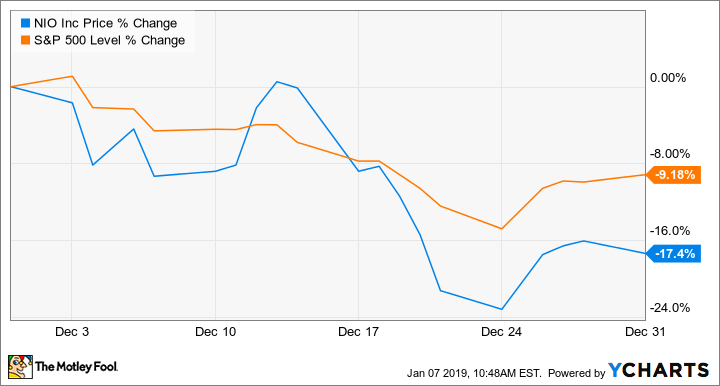 According to data provided by S&P Global Market Intelligence, the price of NIO's U.S.-traded stock fell 17.4% in December. Part of the drop was almost certainly due to the larger marketwide sell-off we saw last month, when the benchmark S&P 500 dropped a bit more than 9%. But NIO's shares took a much bigger hit due to growing concerns about the health of China's new-car market -- and the possibility that Tesla (NASDAQ:TSLA) could be more competitive in the Middle Kingdom than previously expected. As December opened, it seemed like NIO was set for a good month. The company reported that sales and production of its first mass-market model, the ES8 SUV, had continued ramping up as expected in November, and that it was solidly on track to meet or beat its full-year sales and production goals. NIO shared more good news on Dec. 17, when it took the wraps off of its second model, the one-size-down ES6 SUV. On paper at least, the ES6 appears to offer solid performance and range at an attractive price -- a combination that should drive good sales when it begins shipping next June. The all-new NIO ES6 is an upscale five-seat battery-electric SUV that will offer about 300 miles of range for around $65,000. Image source: NIO. But external factors threw a couple of wrenches into NIO's plans in December. Most worrisome: After years of growth, China's new-car market has been slipping. While NIO did well in November, the overall market was down 16% -- a sign that consumer confidence could be sinking. There's another factor: Tesla. NIO has positioned itself as a more affordable, home-grown alternative to the Silicon Valley electric-vehicle powerhouse. The affordability argument has been key: Tariffs have made Teslas imported into China from the United States very expensive. But on Dec. 14, the Chinese government said that it will lower import tariffs on U.S.-made light vehicles to 15% from 40% -- putting imported Teslas within reach of more Chinese buyers. And even more will have a chance to buy soon, as Tesla is breaking ground on a factory in Shanghai that will make affordable versions of the compact Model 3 sedan and an upcoming Model 3-based SUV for Chinese buyers. Those could turn out to be very serious competition for upstart NIO. I expect NIO to report its December and full-year 2018 sales and production numbers soon, likely before the end of this week. Between that, and the company's upcoming fourth-quarter and full-year 2018 earnings report, we'll know much more about NIO's prospects in 2019.